Classes are year round. You can join at anytime! The goal of NINJA ZONE is to take the coordination from gymnastics, the discipline of martial arts, the strength and agility from obstacle course training, and the creativity from break dancing. It’s awesome for kids with lots of energy. The class is fast paced. Boys especially will love this class! Lil’ Ninjas is the the entry level to the all new sport discipline inspired by gymnastics, martial arts, obstacle course training and street dance. Lil’ Ninjas embodies discipline, focused energy, and skill. Children learn combinations of flips, rolls, jumps, & kicks in combination with strength & agility courses. 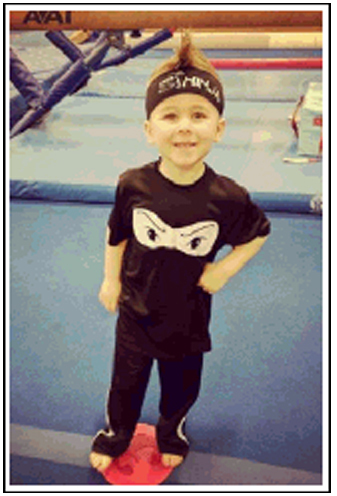 Ninja Zone is an all new sport that is fusion of gymnastics, martial arts, obstacle course training and street dance. It turns freestyle movement and energy into ambition. In these classes, boys learn a combinations of flips, rolls, jumps, and kicks in combination on strength & agility courses. The levels of Ninja Zone are defined by the headband colors of White, Yellow, Green and Blue. Created for the sporty, fearless little girls that loves to flip, jump and kick, but prefers headbands to bows. Ninja Zone is an all new sport discipline inspired by gymnastics, martial arts, obstacle course training and street dance. Ninja Zone Embodies discipline, focused energy, and skill. In this class, girls will learn a combinations of flips, rolls, jumps, and kicks in combination on strength & agility courses. The levels of Ninja Zone are defined by the headband colors of White, Yellow, Green and Blue. 50MIN $94.00 mo. $134.00 mo. SIBLING, 2ND CLASS and MILITARY DISCOUNTS available! -Membership Fee: $35 All students pay an annual membership fee upon enrollment and then each year on the 1st of their Family enroll date. Max of $70 per family.Clients must have a Payment Plan Form on file. Fill it out and bring with you to your first class. -The card you leave on file will be charged on the 1st or the 15th of the month… YOU CHOOSE THE DATE! What does my Ninja wear? -Orders your uniform at Sideline Bling (in the front lobby of K2). How does my Ninja move up? Are your Ninja moves ready for the next level? Ask your Coach if you’re ready for a Ninja Mission! Show your skills to your friends and family as you test to move up to the next level. Successful completion of the Ninja Mission will result in the next level Ninja headband, certificate, and advancement to the next level. Want to Talk to a Team Leader?